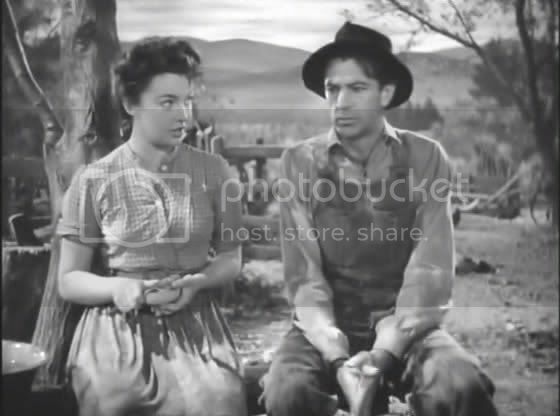 Sergeant York is a simple tale, perhaps, one of a patriotic, religious farmer. It’s a tale of conversion and catharsis, war and peace, love and violence. The first hour sets up the characters and the settings before the reality of the Great War come into play. It seems that Howard Hawks intended the film to be propaganda, as the United States hadn’t quite entered the second World War at the time it was made. Fortunately the message isn’t as simple as the story and the filmmakers seem to take a little time to consider the ramifications of patriotism. 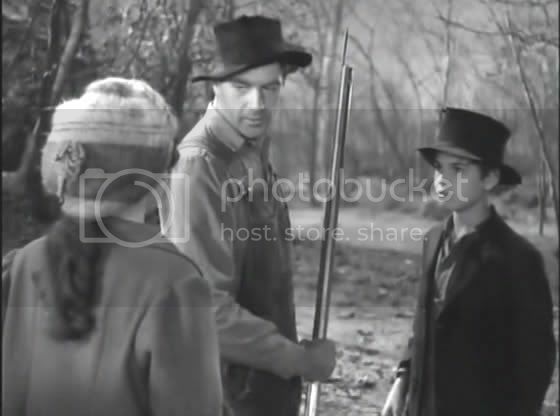 Alvin York (Gary Cooper) is a young troublemaker in a small valley town in Tennessee. He rides hard, drinks hard, and shoots hard. The beginning of the film has him disrupting a church service, embarrassing his proud mother (Margaret Wycherly). 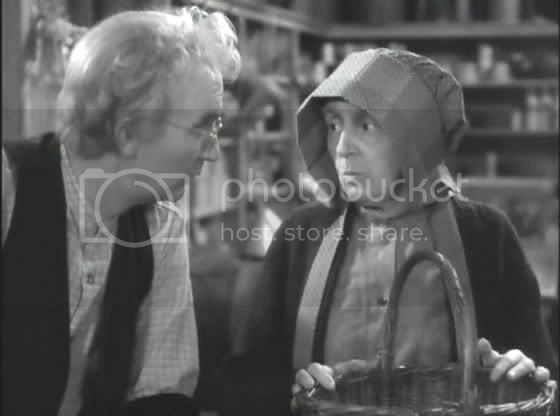 The local pastor (Walter Brennan), who also runs the general store, is sure that Alvin just needs a bit of religion in his life. Alvin may drink hard, but he works hard. He works the land, his hill-side land that’s strewn with rocks and quite difficult to provide any sort of lucrative yield. He wants to acquire some valley land and better provide for his ma and two young siblings. There’s also a pretty lass down the way that could use an established gentleman as a husband. Gracie (Joan Leslie) is sweet and honest, but has other suitors beside Alvin. However, Alvin’s violent outbursts and nefarious dealings when it comes to love turn her off. Then, one day during a lightning storm, Alvin sees God in the form of a lightning bolt that melts his rifle. His near-death experience is cathartic, pointing him toward the Bible. The pastor helps him out with his new-found faith and Alvin’s life is changed. He sets his sights on a fertile piece of bottom land, forgives those he needs to forgive and asks forgiveness for all his misdeeds. The war interrupts Alvin’s difficult, but fulfilling, life when the draft board comes to town. Alvin doesn’t want to sign up, as “The Book’s agin’ killin'”. The pastor has a chat with him, explaining that he can get out of duty by appealing on religious grounds. This method fails, however, and Alvin is drafted and sent off to training camp. His sharpshooting surprises the trainers and the other draftees, as he is near-flawless in his aim. After being pressed into actual service Alvin soon becomes a reluctant hero. He is willing to give his life for his country, but not to kill for the same. He eventually arrives at a point where he understands that if he doesn’t kill the enemy his soldiers will be killed. Throughout the process of becoming a hero Alvin remains a simple farmer, eager to get back to his land and his woman and his family. Not once does he lose sight of the important things. Alvin’s a simple man, a man with the “using kind of religion.” He lives out his faith and is worried about the repercussions of disobeying. Fortunately, the movie never makes him choose solely between his faith and his country; the relationship is difficult and complex and Alvin wrestles with it appropriately. Some of the most amusing aspects of the film are local, both for the time and the setting. The Tennesseans have a unique dialect, often using the vocalization “‘ere” to mean “are,” “am,” and “is.” They are country bumpkins, but all the more sweet for it. The production is adequate, with a large amount of painted backdrops to substitute for mountainous landscapes. 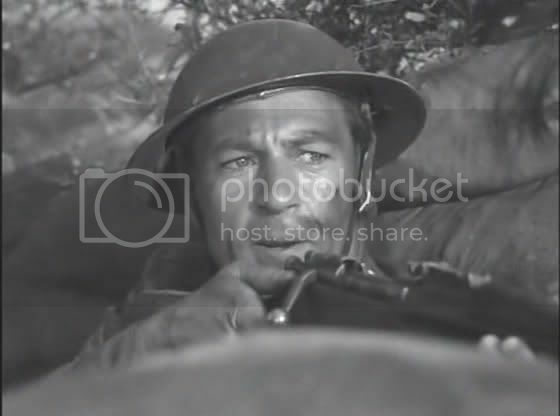 The war scenes, when they finally appear late in the film, are epically staged, very intense and believable. It’s interesting to think that a movie this religious could never be made these days. Everyone is unapologetically aware of religion and its role in their lives, even Alvin’s commanding officer who gives him a book to read and urges him to wrestle through his convictions and his faith. These aspects set Sergeant York solidly in the early 1940’s, and it’s better for it. It moves a little slowly at times, and almost nothing happens, plot-wise, for the first hour. But the journey is worthwhile and interesting, especially for those aware of the struggle between faith and patriotism, particularly where the two meet in conflict. Cooper deservedly won the Best Actor Oscar, and he carries the film. His naivety and simplicity are endearing, teaching us lessons about how a simple life has its advantages. 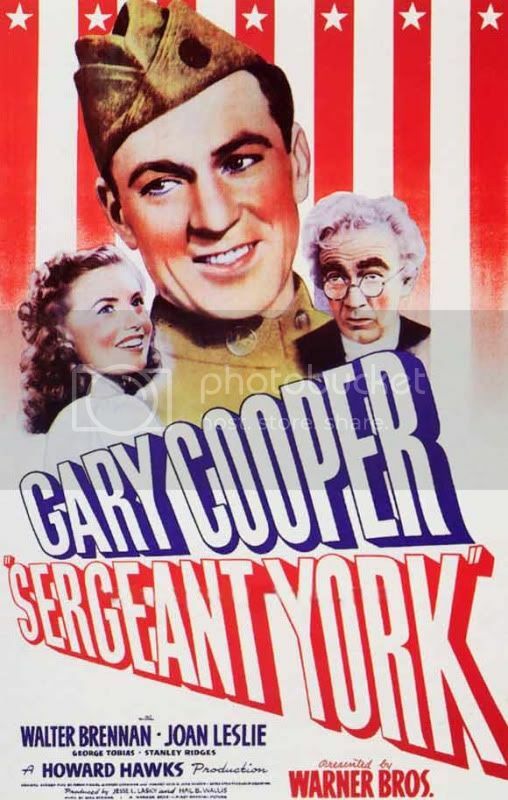 Sergeant York might be a bit arcane and slow for today’s audiences, but anyone with a bit of patience and interest in the material will find it a very worthwhile excursion. This entry was posted in 2 pirate flags, 3.5 stars, Movie Reviews, Pirate Flag Rating, S, Star Rating on April 25, 2010 by Tim Irwin.